You Save $13.30 by purchasing this kit rather than buying the items separately. 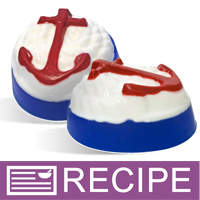 COMMENTS: I met with an advertising representative for our local telephone directory, she was preparing to take photographs of my bath & body products for my ad, when I showed her a picture of the Anchors away soap that I was preparing to make the next day. She became so excited, she order several for pick up! Following your directions, these soaps came out beautifully! They smell wonderful and are so cute. I have received numerous compliments already and that is just on facebook. Can't wait for my store customers to see them!